TAIPEI – The maiden flight of China’s new stealth jet fighter humbled those officials and observers who initially dismissed the possibility that the country could come up with such a sophisticated weapon any time soon. It was strikingly demonstrated that neither the intelligence apparatus of the United States nor that of Taiwan had a clue about the speed of Chinese advances. Unnoticed by Beijing’s adversaries, the J-20’s engineers have mastered advanced stealth-shaping techniques, and even if mass production still lies a few years ahead, it is understood that the Chinese People’s Liberation Army Air Force (PLAAF) in the foreseeable future will have super-cruising aircraft at hand that can’t be stopped by any air defense system in Asia, including those of the US Navy’s aircraft-carrier battle groups. Needless to say, this has tremendous repercussions for Taiwan’s security situation. Yet, despite the grave implications for the island, intelligence officials in Taiwan were at first quick to dismiss photos depicting the J-20 as fakes prior to the test flight. Then, after the authenticity was proved, they kept remarkably quiet. But now as the dust begins to settle, Taipei senses that mainland China’s show of force could well give Washington a justification to revive major arms sales to the island. Coinciding with a visit to Beijing by US Secretary of Defense Robert Gates, China unveiled the prototype of its stealth aircraft that experts say could rival the US Air Force’s F-22A Raptor – the world’s only fully operational next-generation stealth fighter aircraft. As no technical details have so far been disclosed by the Chinese, observers rely purely on speculation. 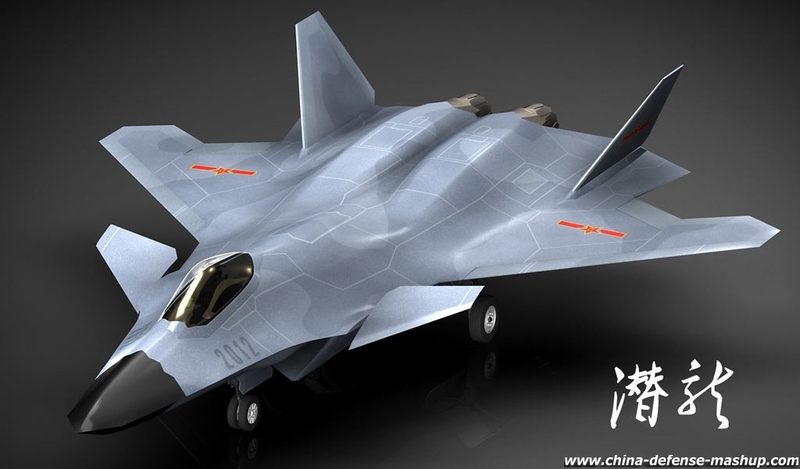 But since the first images of the J-20 were published on the Chinese Internet in December, the tenor of the assessments has gradually reached an intriguing consensus. The aircraft is bigger than expected and can therefore fly farther, and in terms of air-combat capability, it’s said to be superior to the US F-35 Joint Strike Fighter currently still being developed, or the F/A-18E/F Super Hornet. Furthermore, the J-20 can super-cruise to and from targets, a feature that doubles the effective sortie rate. The only weapon system the US has in its arsenal to match the J-20 is the F-22A Raptor, an immensely costly aircraft which for the time being is left without funding for further production. The solution that suggests itself when seeking to destroy an “invisible” aircraft is attacking it while it’s still on the ground. However, this could also prove difficult for the US and its allies. This is because the PLAAF and People’s Liberation Army Navy (PLAN) have access to a few hundred airfields, with some of them dug deep underground. Moreover, the extra-large fuel capacity and supersonic cruise capability of the J-20 mean China can choose to base them hidden very deep inside its vast territory. Today’s battlefield effectively starts off as a duel between Integrated Air Defense Systems (IADS), a term that describes systems that put all anti-aircraft sensors and weapons under a common command. In any conflict that would involve China in the next decade, a reasonably sized fleet of J-20s would likely first take on US and allied IADS located within the Second Island Chain, a maritime line that runs roughly from the north of Japan to the Pacific island of Guam and then south until it reaches Indonesia. US Air Force and Navy tankers could be destroyed, and operations at US and allied airfields on Guam, the Ryukyu Island chain, the Japanese main islands and the Korean Peninsula significantly complicated, if not shut down. As China regards eventual unification with Taiwan as in its national core interest and has all along been signaling that it wouldn’t shy away from picking up a fight over the matter, the question arises of how Taiwan’s leadership assesses the newly emerged threat of the Chinese stealth fighter. But since unlike US officials, Taiwanese ones have so far chosen to stay remarkably mum, the answer has to come from the island’s scholars. To the Taiwanese, somewhat more spine-chilling than the actual threat the J-20 projects is the sudden demonstration of how far China is willing to go in its quest to counter US hegemony in the region, says Arthur Ding, a cross-strait military affairs expert at Taipei’s National Chengchi University. “Although it could take 10 years for China to achieve real progress, the unveiling of the J-20 shows China’s determination to spend huge resources to develop new fighters”, he says. Just as no official statement was made by the Taiwanese authorities regarding the J-20’s maiden flight, the island’s Ministry of National Defense and its air force wouldn’t comment on a recent, much-noted report by the Washington Times, according to which the US – under the shadow of the news surrounding the J-20 – decided to give the green light to an upgrade of Taiwan’s existing fleet of F-16A/Bs. The report estimates that the US would wait with an announcement over the deal – possibly worth US$4 billion – until after Chinese President Hu Jintao’s visit to the US between January 18 and 21. An arming of Taiwan’s 146 14-year-old F-16A/Bs with new electronics, engines and possibly the sophisticated AIM-9X Sidewinder air-to-air missiles is certain to outrage Beijing, even if the sales wouldn’t cover the new F-16C/Ds Taiwan has long been requesting. “Taipei keeps a close eye on the implications of the J-20 test flight for US arms sales to Taiwan”, says Li. For Wang, Taiwan has no other option but the significant strengthening of its anti-symmetric warfare capabilities. And Ding believes that this is what the island’s military has already begun doing. “Taiwan’s three services are discussing how to repel China’s superior force from their inferior position,” Ding says. A major aspect of the maiden J-20 flight that still puzzles Taiwanese observers is the obscure way Beijing chose to disclose the event, letting photos of the stealth fighter leak to open Chinese military Web forums. In what appeared to be a move to deliberately fuel speculation, according to Taiwanese lawmakers, China’s engineers fixed an emblem on the tail fin of the aircraft not consistent with that of the PLAAF and another one on the front wings sporting a design no longer used. Although it was widely speculated that Beijing chose to disclose the J-20’s test flight for the sake of maximizing the political and psychological impact, Taiwanese scholars like Li don’t quite buy this as the real motive. The Taiwanese in charge of finding answers to Li’s question would be close to the deputy chief of the general staff for intelligence at the Ministry of National Defense, Shen Yi-ming. Shen was the high-ranking intel official who, when questioned by Taiwan’s legislature, prematurely dismissed the photos of the J-20 prototype as fakes. This makes one wonder what Taiwan’s intel officers were actually doing during those years when China brought its first stealth fighter into being. However, it is clear what the retired predecessors and former superiors of these spies were up to in the days the PLAAF was preparing to move the J-20 onto the tarmac. They, traveling in a group of 19, were hosted by the Chinese Communist Party for a five-day leisure trip to the Chinese mainland. Jens Kastner is a Taipei-based journalist. Asia Times Online (Holdings) Ltd. Previous Al-Qaeda to unleash Western jihadis?